B2BGateway, a leading global, cloud-based EDI solution provider has been recognized as a ‘Top 20 Most Promising Logistics Solution Provider’ by CIOReview Magazine for its work in providing seamless integrated EDI solutions to Third Party Logistics Providers (3PL) and all relevant parties in the supply chain. B2BGateway has a successful proven track record of providing latest technologies for the companies that sets a new foot print in the logistics arena. 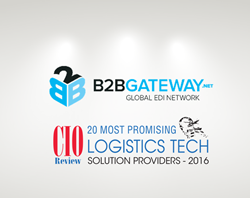 B2BGateway, a leading global EDI solution provider and Data Integration specialist, announced today that it has been included in the list of “20 Most Promising Logistics Tech Solution Providers 2016” by CIOReview. B2BGateway is ranked based on the Warehouse Support System (WSS), which combines the best of Web based EDI and fully integrated EDI gives organizations importable Purchase Orders and Printable Pick Tickets in their warehouse. Using the Web interface, warehouse employees can print their own Pick Tickets, confirm shipments, generate Advance Shipping Notifications and print UCC-128 Barcode Labels. The WSS works in conjunction with the fully integrated EDI so orders are still imported into their backend ERP system, (not typed), and Invoices are extracted. Roger Leyden, Director of Global Business Development at B2BGateway adds “B2BGateway is delighted to be recognized as a ‘Top 20 Most Promising Logistics Tech Solution Provider’ by our industry peers at CIOReview. Since our foundation in 1999 we have worked hard to provide our clients with leading automated supply chain software that reduces errors, automates process flows and drastically cuts operating costs. B2BGateway’s cloud based EDI solutions are ideal for logistics providers working in the new omni-channel environment as they allow full seamless communication and visibility between all parties in the supply chain”.